Don’t like the way dairy makes you feel? You’re not alone. Even if you don’t suffer an allergy to dairy products like cheese or milk, eating these foods in excess can add an unwanted surplus of saturated fat and cholesterol to your daily diet, making you feel sluggish, body-conscious due to the physical result, and in need of an alternative to keep you on a healthier path. Six in ten American households report that at least one member of the family has a dietary restriction, and combined with the increasing number of people practicing veganism (avoiding any foods that come from an animal), there’s been an uptick in the search for substitutes for the tried-and-true staples of the past that we never knew were so bad for us-- until now. You might not believe us when we say some of these alternatives taste so much like the real thing, you won’t even miss what you’ve given up. And even if it’s not an exact replica of a stick of butter, or a gallon of 2% milk, mixing up your diet with these plant-based substitutes will leave you feeling healthier and more productive. Move over, soy milk! While dairy-free milk alternatives have been on the market for a long time, online reviews and customer feedback suggests the taste of almond milk is preferred over soy milk products. Elmhurst’s Unsweetened Almond Milk has similar benefits to the real thing, as a plant-based alternative that’s got 18 almonds packed within every glass you drink. Almond milk contains protein (in this case 5 grams in each serving), which will increase your energy, and can be used as a substitute for real milk while cooking, baking, or simply in a bowl of cereal. Plus, Elmhurst only uses two ingredients: almonds and water. Whoa! Let’s face it --the reason why our grandmothers’ cooking was always so good has a lot to do with the amount of butter she’d sneak in the pan when no one was looking. Butter adds moisture, flavor, and sweetness to so many dishes but it’s no secret that it’s not something you should pile on your plate. And while coconut oil serves as an alternative to butter, it does have a slightly higher calorie and saturated fat content. But as they say, it’s the “good kind”! Like butter, it’s solid at room temperature and is a perfect substitute if you’re baking, as it will not change the texture of your baked goods. It sounds crazy that you can eat a yogurt substitute that’s still considered yogurt, but with brands like Silk who have revolutionized the dairy-free game, it is now possible to enjoy the texture and taste of a lactose-filled yogurt without any dairy at all. These yogurts are packed with plant-based proteins, are certified non-GMO and vegan, and are free of any artificial colors or flavors. Of course, you can always add even more flavor to your non-dairy yogurt by sprinkling in some fresh granola, almonds, and fruit. JUST products have recently launched a plant-based product to replace eggs, and it looks and cooks just like regular scrambled eggs do. JUST Egg can be used as a scramble mix for fried rice, to dip your french toast into, or it can be eaten on its own in a vegan egg sandwich. Now, this really seems too good to be true, especially considering the JUST brand has had its fair share of controversy surrounding its other dairy-free products like its egg-free mayonnaise; but this review for JUST Egg says this new-and-improved product from the brand exceeds expectations. Real cheese is a guilty pleasure for many of us --and it’s one dairy product that seems way too difficult to give up with all the varieties and uses for cheese in our diets. And when vegan cheese first came out as an alternative to the real thing, there was definitely some work to be done to improve it. But since then, the vegan cheese product category has come a long way and has expanded its offering to include artisan cheeses and even cream cheese substitutes. Kite Hill products use almond milk to create ricotta cheese and cream cheese that can be used as a dairy-based substitute for cheese or sour cream. The cream cheese comes in a variety of flavors from plain, to jalapeño, to chive, and the ricotta can be used for a vegan cheesecake or pasta dish. YUM! 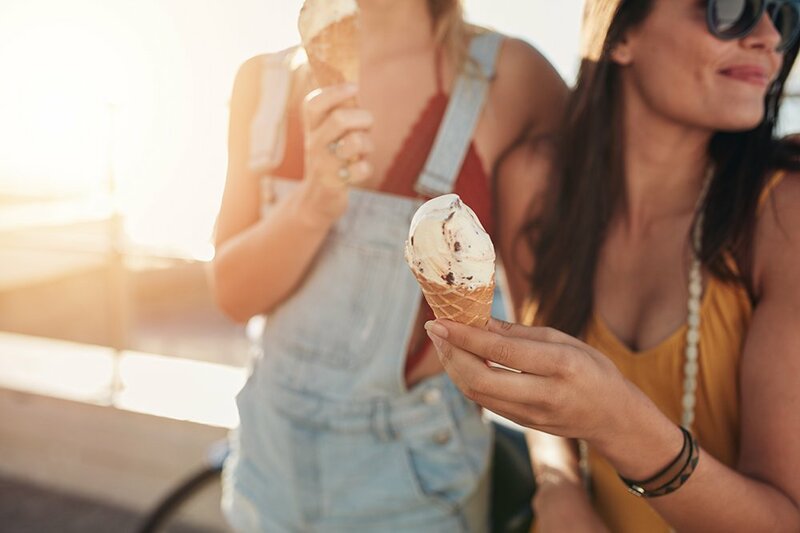 We get it --sometimes substituting the real thing for a healthier alternative can make you feel a little left out, especially when it comes to something as traditionally sweet and satisfying as ice cream. Ben & Jerry’s gets it too, and that’s why they’ve adapted some of its most popular flavors into dairy-free versions that those with dietary restrictions can enjoy. Seriously! They went all out in creating an almond milk alternative recipe that still includes all your favorite mix-ins, allowing the dairy-free flavors of Chunky Monkey, Cherry Garcia, Cinnamon Buns, Chocolate Fudge Brownie and many more. So, you can still grab your classic Ben & Jerry’s pint at the grocery store and cuddle up on the couch for a night of binge-watching your favorite show with your girlfriends. Talk about sweet! See, cutting out traditional dairy doesn’t seem so bad anymore, does it? Start small --think about a few substitutes you can test out and slowly work into your routine. You’ll thank yourself in the long run, whether you’re doing it for your diet or to simply make the lives of the animals out there a little bit easier.